The 11th Annual City of David Archaeology Conference is scheduled for Wednesday, September 1. One item that will be discussed is the recently discovered 2,000 year old semi-precious cameo with an image of Cupid (the Eros of Greek mythology) on it. Cupid Cameo found in Jerusalem. Photo IAA/Clara Amit. 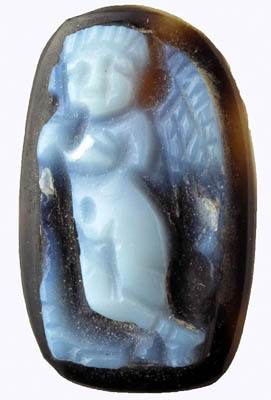 This inlaid stone is of the “Eros in mourning” type, and is one of a group of visual motifs connected with the imagery of mourning practices. Jewelry bearing such motifs – earrings and rings, were not necessarily worn only in mourning rites, rather, they also served as memento mori, reminders of the fleeting nature of life. The cameo, which is thought to have come from a piece of jewelry, is 0.39 in. long and 0.03 in. wide. It was discovered in the Givati Parking lot excavation under the direction of Dr. Doron Ben Ami and Yana Tchekhanovets. We have noted other surprising discoveries in this area here and here. The area is not open to the public. Last May I made this photo through a hole which had been made (by someone else) in the metal fence surrounding the area. This site is immediately south of the old city wall, a few hundred feet east of Dung Gate. Needless to say, construction of the garage has been delayed. This is what happens when one begins to dig in Jerusalem. Givati Garage Excavations. Photo by Ferrell Jenkins. The promised land, which the Israelites were about to enter, is described as a land of trees and crops. 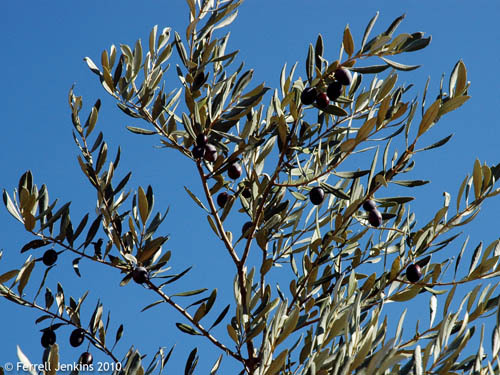 Note that the land is a “land of olive oil.” In addition to using the olive for food, and in cooking, several other uses are mentioned in the Bible. Oil for anointing the body – Deuteronomy 28:40. Oil for anointing sheep – Psalm 23:5. Medication – Isaiah 1:6; Mark 6:13. Anointing priests, et al. – Exodus 29:7; Psalm 133. Oiling the shields of war – Isaiah 21:5. When an unworthy man by the name of Abimelech promoted himself to be the king of his people, Jotham went up on Mount Gerizim and spoke to the leaders of Shechem. The full story is in Judges 9. In Jotham’s parable (or fable) the trees of the forest called on various trees to rule over them. The trees first called on the olive tree to reign over them (v. 8). Look at the words of the olive tree as he excused himself. After that, the fig and the vine likewise excused themselves. Finally, the worthless bramble accepted their offer boasting of what he could do for them. The photo below is a rather typical scene in the central mountain range of Palestine/Israel. Rather than the vast acres of olives trees in a row, like I have seen in Spain, these are scattered. A few other trees are mixed among the olives. Scattered olive grove on a hill below Mar Elias Monastery. Photo by Ferrell Jenkins. Mar Elias Monastery is located on the east side of the main road between Jerusalem and Bethlehem. One religious tradition from the Byzantine period has it that Mary rested at this place on her way to Bethlehem. Another has it that Mary stopped here for water on the flight to Egypt and water flowed from a rock. See The Holy Land by Murphy-O’Connor for more info. The next photo is of terraced olive groves in the central mountain range south of Shiloh. Terraced olive groves south of Shiloh. Photo by Ferrell Jenkins. Presentation quality photos are available by clicking on the images above. The illustration used by Paul in Romans 11 to describe the relation between the Jews and the Gentiles is both memorable and instructive. His point is simple. The Jews were cut off because of their unbelief. Gentiles were grafted in through their faith in Christ. The Jews may again be a part of the tree by accepting Christ. In the photo below we see that new branches have been grafted in the older, well-rooted stump. Olive tree with grafts at Nazareth Village. Photo by Ferrell Jenkins. Grafts on an old olive stump. Photo by Ferrell Jenkins. Paul addresses the problem of arrogance on the part of Gentile Christians. He reminds them that, as branches, they are dependent on the root. Remember that Jesus is the root of David (Revelation 5:5; 22:16). He informed the woman of Samaria that “salvation is from the Jews” (John 4:22 ESV). In directing tours I have encountered a few guides who think that a Christian group is interested only in “Christian sites.” This is far from true. In most of our churches the majority of the classes at any given time will be from the Old Testament. Click on the photos for images large enough for use in your teaching. More to come about the uses of the olive and oil production. What is the first tree mentioned by name in the Bible? After a visit to the art museum one might say, “the apple.” But there is nothing about the apple in Genesis. I don’t mean the “tree of the knowledge of good and evil” either. The first is the fig. Adam and Eve tried to cover their nakedness by sewing together fig leaves. I really want to write about the second tree named in Scripture. It is the 0live. After the flood, Noah sent out a dove to see if the water had receded. The land of Canaan, promised by the LORD to Abraham and his descendants, was to be a land that included figs and olives. Olive trees flourish in the mountainous terrain of the land of Canaan/Israel/Palestine (this is not a political discussion). Here are some photos of olive trees. The first is one of the older trees in the traditional Garden of Gethsemane on the Mount of Olives. In fact, it appears that two trees grew together. An older Olive trees in the traditional Garden of Gethsemane. Photo by Ferrell Jenkins. Here are a few trees at Sepphoris in Galilee. Olive Trees at Sepphoris in Galilee. Photo by Ferrell Jenkins. And this photo is a close up of a branch and some of the leaves. The photo was made at Neot Kedumim in the Shephelah of Israel. Olive Branches at in the Shephelah of Israel. Photo by Ferrell Jenkins. Later we will follow up with more about the uses of the olive. Last week we posted a note about the discovery of a rare Ptolemaic gold coin at Tel Kedesh in northern Israel. See here. Gold coin of Arsinoë Philadelphus (II) discovered at Tel Kedesh. Photo by Sue Webb, courtesy IAA. If you would like to read about a truly mixed up family, I suggest you read Judith Weingarten’s post on “The Uppity Queen Arsinoë II” at Zenobia: Empress of the East blog here. I think this story tops almost anything I have read. It is too complicated for me to try to retell it in a few words. It will be especially helpful in speaking with those who think today’s culture is the worse the world has ever known. Recently we wrote about the Valley of Beracah here. The biblical account says Judah came out to the watchtower or observation post to see the overnight progress of the armies of Ammon, Moab, and Edom. Watchtower at Nazareth Village. Photo by Ferrell Jenkins. The prophet Isaiah speaks of a watchtower built in the midst of a vineyard. Our photo was made at Nazareth Village, a must stop on your next visit to Israel. (I note that the web site is temporarily offline.) Click on the photo for an image large enough to use in presentations. Several times in the past three years we have called attention to the site of Magdala (Migdal). Last September we noted announcement by the Israel Antiquities Authority of the discovery of a synagogue from the Second Temple period (50 BCE—100 CE). 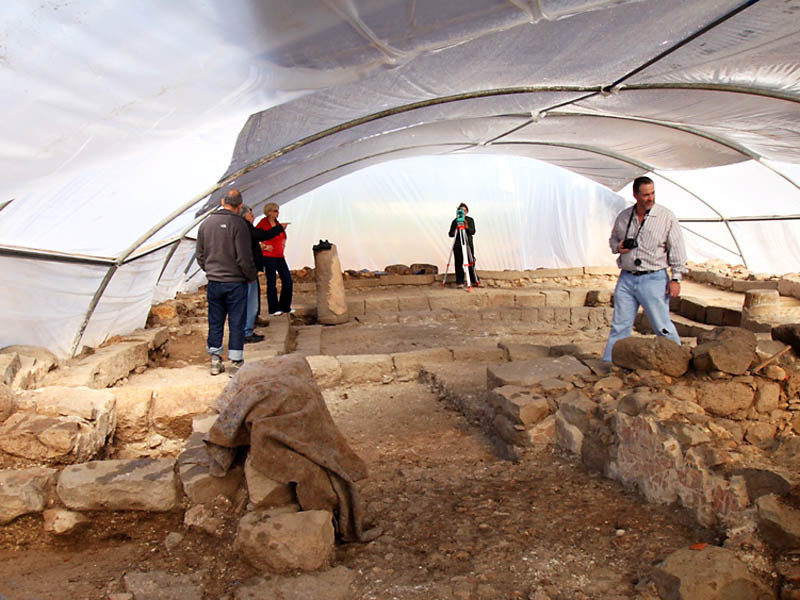 A synagogue from the Second Temple period (50 BCE—100 CE) was exposed in archaeological excavations the Israel Antiquities Authority is conducting at a site slated for the construction of a hotel on Migdal [Magdala] beach, in an area owned by the Ark New Gate Company. In the middle of the synagogue is a stone that is engraved with a seven-branched menorah (candelabrum), the likes of which have never been seen. The excavations were directed by archaeologists Dina Avshalom-Gorni and Arfan Najar of the Israel Antiquities Authority. The town of Magdala is not mentioned in the Bible, but Mary Magdalene is mentioned a total of 12 times in the four gospels. This place may have been her birthplace or her home. A few late manuscripts mention Magdala (Matthew 15:39 KJV), but earlier manuscripts read Magadan. Magdala is located about 4 miles north of Tiberias on the western shore of the Sea of Galilee. “In ancient times, pickled sardines were an important element of diet throughout the country–especially for those who lived near the lake” (BAR, Nov/Dec 1993). Josephus had his headquarters at Magdala during the first Jewish Revolt against Rome (A.D. 66-70). He was able to get a group of at least 230 boats to go from Magdala to Tiberias (Jewish Wars 2.635-637). Vespasian attacked the town from the sea and destroyed it. Magdala with Mount Arbel to the West. Photo by Jim Joyner. Recently Jim Joyner, one of our readers, offered to share a few of his photos made at Magdala earlier this year. The photo above shows part of the residential area of Magdala with Mount Arbel in the distance to the west. The synagogue excavation is under the tent in the distance. The Sea of Galilee would be to our back. The residences were first excavated. Eventually the remains of a synagogue were discovered. It was a magnificent discovery! The walls of the synagogue are clear, and the places where seats were located in the synagogue are obvious. The walls were beautifully frescoed, and the remains of the colors are still obvious on the uncovered portions of the walls. The Magdala/Migdal Synagogue. Photo by Jim Joyner. Thanks, Jim. We look forward to seeing more of these great photos. We wrote about the Magdala Excavation Project here.